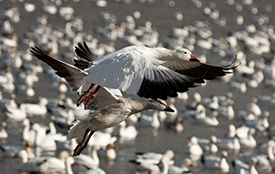 Snow geese are hard to decoy since they are smart enough to evade even the savviest waterfowl hunters. However, the thrill in the hunt is the pursuit making it even more worth the investment in effort. If you have never been a part of this spectacle, maybe you should consider spring snow goose hunting this year. Listed below are some of the things that are usually taken into consideration when snow goose hunting in Missouri. During the early stages of the hunting season, it is crucial that hunters are able to align themselves along the traditional migration corridor. This gives them the perfect opportunity to decoy the first birds as they fly into the areas that had been snow covered. The second wave of migration takes place as the birds move north towards the retreating ice line. Experts advise hunters to expect a mixture of both juvenile and adult geese in the second wave. During this stage, the birds will most often stall along the migration path offering a good opportunity to witness fall like patterns of them flying from the roost to the already established feeding areas. These flocks have more juveniles and hunting season tends to pick up more then. The snow geese are ravenous feeders who will always concentrate on the upwind region of any flock; this is where fresh food lies. This is also the same area where hunters setup. By running about 800 to 1500 decoys, hunters create a teardrop pattern with the majority of decoys fitted on and around blinds that are located close to the crown of a spread. Decoying birds are lower in concentration downwind with the mass number placed upwind. The landing space created by the decoys should place the birds directly in the line of vision of hunters. Callers are placed on both upwind and downwind portions of the spread. The volume on the callers has to however, be carefully watched. This is because if the downwind callers are loud, the birds will be spooked as they set up around your decoys. The list of items required for decoying spring snows is long, not mentioning expensive. For that reason, most hunters opt to hire a guide. A guided hunt is the most logical choice for anyone who does not want to be tied down by the colossal amount of money that will be required for equipment that will be in use for only a few days every year. Another advantage of guided snow goose hunts is that you get to find prime lands quickly. However, when finding a guide it is prudent that you ask many questions. Springtime not only beckons waterfowl hunters towards Missouri goose hunting, but also because of the liberal limits, if there are any limits at all, as well as the unplugged shotguns that hunters hold close to their hearts.